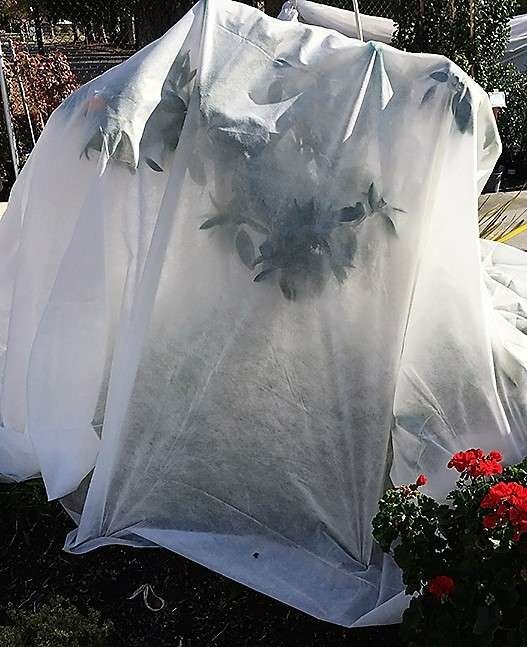 Properly applied frost cloth can protect your frost sensitive plants from the cold even when the temps dip into the 20s. The objective of frost cloth is to trap the heat to keep the plant warm. Sunlight during the day warms the soil surface. As the day progresses into night, the heat from the soil radiates into the atmosphere. Always use frost cloth designed for covering plants. Frost cloth is made of a fabric that will not transmit cold to the leaves. Other products, those made of plastic for example, can actually transmit cold to the leaves and cause more damage. We also do not recommend using blankets or towels because they are heavy, can be hard to secure over your plant, and don’t allow sunlight in. Green Acres Nursery & Supply carries only the best frost protection products. Choose from reusable sheets or framed covers that are light and easy to handle. 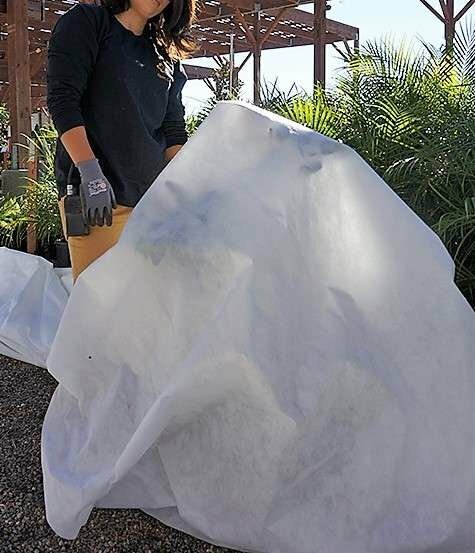 And if necessary, the frost cloth can be left on the plants for an extended period of time without the risk of harming your plants—it's lightweight and allows the sun to pass through the fabric. Sheets or blankets, however, must be removed every morning once the temperature reaches at least 40 degrees. Completely drape the plant from the top all the way to the ground. Apply the cloth right before sundown to make sure the cloth gathers the heat produced in the ground during the day. Don’t leave any openings in the cloth for the warm air to escape or cold air to enter at night. It is crucial that the frost cloth touches the ground, to the drip line of the plant. Placing a heavy object like bricks or securing the fabric into the ground with frost fabric staples will ensure that the cloth forms a seal with the ground and traps the warm air that radiates from the soil that is captured during the day. The bricks or staples will also secure the cloth in the case of heavy winds and/or rain, reducing the chances of it blowing away. Remember, it is crucial that the frost cloth touch the ground to soak up radiant heat captured during the day. This is true of trees too! If you just wrap the top of the tree with frost cloth and leave the trunk exposed, much like a lollipop, the tree will not be able to trap the radiant heat from the ground. 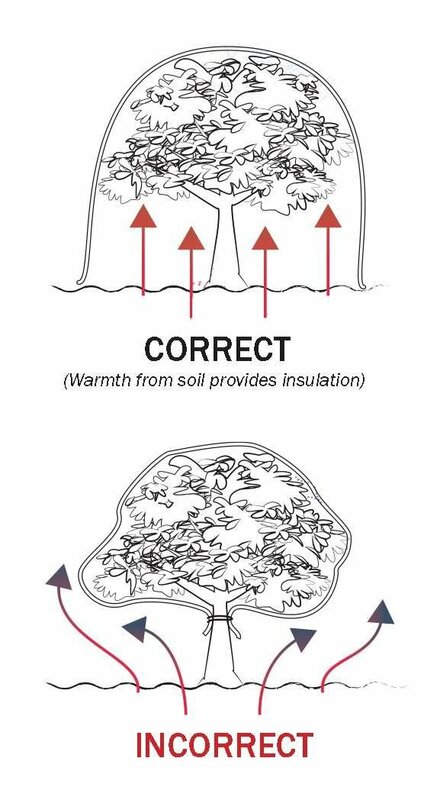 Also, the cold night air will sink to the ground and the fabric will not be able to collect the heat or moisture to help the frost cloth protect the tree. Watering + Frost Cloth = Success! Plants will incur more frost damage if they're dehydrated, so it's important to keep soil around the plant moist—but not soggy—especially during times of wind or days without rain. Ice crystals can form on the leaf surface and take moisture out of the leaves. One way to protect leaves from this moisture lost is with Bonide® Wilt Stop® Plant Protector. Wilt Stop® forms a soft, flexible, clear film on plants and protects them from drying out, drought, windburn, sun scald and winter kill. It is a natural, non-toxic product, derived from the resin on pine trees. Next article Distressed Lawn: Revitalize or Replace?